Mike Bailey is a long-standing Debenture Holder, who was elected as a Director of Wests Ashfield in 2010 and has been Chairman of the Club for more than six years. He has appreciated the cooperation of his fellow Board members and the management team in providing a range of improved facilities, which are available for the enjoyment of the Club’s members and their guests – including the new Sports Bar which opened in 2017. 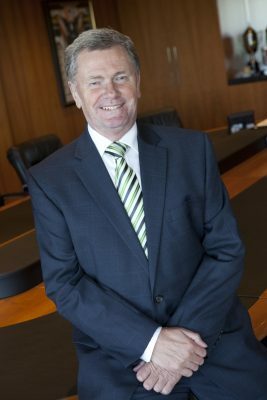 From the earliest years of his membership, Mike has hosted numerous events including the annual Community Citizenship Awards and ClubGRANTS functions, which continue delivering strong financial support to the local community. He also has been a Board member of several charities and continues to assist that sector. Mike’s keen support for Wests Magpies developed well before he completed his school education at De La Salle College, Ashfield. He is a member of the Board of Wests Magpies and is a former Board member and Chairman of Wests Tigers. Most of his professional life has been spent as a journalist working with the Seven and Nine television networks, radio stations 2GB and 2KY, the ABC and various print outlets. He continues to write a column for The Catholic Weekly newspaper; works in the Church’s administrative and fund-raising operations and is a commentator for various other events such as remembrance ceremonies at the Australian War Memorial in Canberra. He has provided media training to government and private sector outlets and was lecturer and course coordinator for Electronic Journalism studies at Macleay College for 10 years.